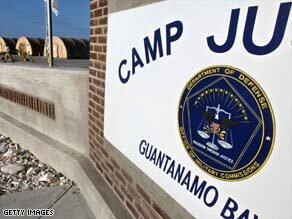 WASHINGTON (CNN) -- Security experts are questioning information released by the Pentagon last week, saying 61 former detainees from its detention center at Guantanamo Bay, Cuba, may have returned to terrorist activities. President Obama has signed an executive order to close the Guantanamo Bay, Cuba, detention facility. That figure would be about 11 percent of the roughly 520 prisoners who have been released from the Guantanamo facility, which Obama on Thursday ordered be shut down. On Friday, a Pentagon spokesman defended the integrity of the report but would not directly answer questions about where the figures come from. "We don't make these figures up. They're not done willy-nilly," spokesman Geoff Morrell said. Pentagon officials have said they would not discuss how the statistics were derived because of security concerns that such information could give clues to how U.S. intelligence officers collect their data. "It is painstakingly done by the Defense Intelligence Agency, and they go over this with great care," Morrell said. He said evidence of someone being "confirmed" to have returned to terrorism could include fingerprints, a conclusive photograph or "well-corroborated intelligence reporting." CNN has learned that some former Guantanamo detainees have returned to the fight. AC360 Blog°: Worst of the worst at Gitmo? An al Qaeda video viewed by CNN's Nic Robertson showed militants labeled with their former prisoner numbers. Saeed Shihri, Prisoner No. 372, is believed to have been responsible for an attack on the U.S. embassy in Yemen that killed nearly a dozen people in September, barely a year after he was released from Guantanamo. Others have included Abdullah Mahsud, who blew himself up to avoid capture by Pakistani forces in July 2007, and Ruslan Anatolivich Odizhev, who was transferred to Russia in March 2004 and killed in a June 2007 gunbattle with Russian security forces. Peter Bergen, a national security expert and CNN analyst, notes that of the 18 people the Pentagon says are confirmed to have engaged in terrorism, only a handful of names have been released. If one accepts that all 18 on the "confirmed" list have returned to the battlefield, that would be 4 percent of the detainees who have been released, Bergen said. Bergen also noted Federal Bureau of Justice Statistics data that show the recidivism rate for U.S. state prisoners who have been released is more than 65 percent. Those same numbers show that about half of the released prisoners are returned to prison. Bergen said that some of the prisoners at Guantanamo may not have been terrorists at all but were singled out by vengeful villagers who told U.S. authorities they were al Qaeda. "We know that a lot of people who were in Guantanamo don't qualify as being the 'worst of the worst,'" he said, quoting former Defense Secretary Donald Rumsfeld's assessment. Bergen said some of those "suspected" to have returned to terrorism are so categorized because they publicly made anti-American statements, "something that's not surprising if you've been locked up in a U.S. prison camp for several years." In a briefing Thursday, Secretary of Defense Robert Gates -- an advocate for closing Guantanamo while serving under President Bush and, now, under President Obama -- seemed to downplay the number of former detainees who have returned to fighting. "It's not as big a number if you're talking about 700 or a thousand or however many have been through Guantanamo," he said. As the Pentagon begins the work of closing the facility and finding places to send, or release, detainees there, Gates stressed that security will remain his top concern. "Clearly, the challenge that faces us, and that I've acknowledged before, is figuring out how do we close Guantanamo and, at the same time, safeguard the security of the American people," he said. "That's the challenge that we will continue to face." CNN's Mike Mount at the Pentagon and Brian Todd contributed to this report.